The University of Texas at Austin has ruled that "Biography or oral history research involving a living individual is not generalizable beyond that individual. Therefore, it does not meet the definition of research and does not require IRB review and approval." This is based on the recommendations of a University of Texas System task force report whose public release I am trying to secure. It is a stronger than Texas's earlier statement that oral history "in general" did not require review. Proposed research including journalistic interviews, oral histories, biographical profiles, or other forms of nonfiction narratives, normally does not fall within the jurisdiction of the IRB. In these cases, the individuals being interviewed understand that they are being quoted, and have every expectation that their views will be made known. The interviewees are advised of their right to remain anonymous, to have their remarks printed without attribution, or kept 'off the record'. If the interviewee is directly quoted, they are allowed to read or hear the quotations attributed to them. The interviewee will also be advised of any publication plans for the project. Most projects from Humanities meet the above criteria; therefore they do not qualify for the IRB review, and do not need to submit their project to the IRB for approval. Other colleges and universities that have cleared oral history include Amherst College, Columbia University, University of Missouri-Kansas City, the University of Michigan, and the University of Nebraska-Lincoln. This is still not a long list, but the field is shifting from early 2006, when the American Historical Association struggled to find such unambiguous statements. Update, 4 May 2010: I have posted a copy of the Texas report. ...but still none in the UK? I am unaware of any UK universities that have similar policies. Nor am I aware of UK universities that explicitly require review of oral history projects. Has there been any talk about the relationship between, on the one hand, "journalist interviews," "oral histories," and the others on the list, and on the other hand, "open-ended interviews" that anthropologists and sociologists sometimes find themselves doing? 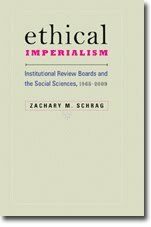 While many argue that anthropology and sociology should not be subject to regulation, few dispute that they are, since that was the intent of the National Commission for the Protection of Human Subjects of Biomedical and Behavioral Research. The same commission fairly clearly did not intend to regulate journalism or oral history, and the university policies reflect that.